KIEV, Ukraine -- In a large building in a quiet neighborhood of Kiev, Ukraine’s capital, young people stand in line to pass through metal detectors. Mostly in their twenties and early thirties, the Ukrainians entering the highly secured yet largely nondescript building are charged with a sensitive task: unmasking high-level government corruption. Artem Sytnyk is the director of the National Anti-Corruption Bureau of Ukraine. Artem Sytnyk, 37, heads Ukraine’s National Anti-Corruption Bureau, known as NABU, leading its team of young investigators as they attempt to root out corruption among top-level officials — ministers, military officers, even judges. Talking in his sparsely furnished office, Sytnyk is understated, giving the impression of a man who does not like chatting about himself. He takes his task seriously — this, after all, is a country where politicians curry favor by controlling major television stations. And Sytnyk is an outsider to politics. Even as he proves himself, he bears the hopes of a generation wanting something better out of its public servants. Sytnyk’s rise to his current office is wrapped up in his country’s history. Born in a village with a population of less than 5,000, Sytnyk worked his way up after law school, starting his career as an assistant district public prosecutor in Kirovohrad, his native region. But merely three years after he was promoted to a post in the investigation department of the Kiev region’s prosecutor’s office — a dream job — he quit. The nation’s leader was, at the time, Viktor Yanukovych, a pro-Russian, highly corrupt politician who, together with his allies, stole millions from Ukrainian taxpayers. Yanukovych’s countryside palace, complete with a helicopter landing pad, car collection and even a private zoo, has since become a symbol of an era where politicians saw themselves as above the law. “There was no rule of law under Yanukovych, so I decided to leave,” Sytnyk recalls. But in late 2013, mass protests broke out against Yanukovych’s regime: Hundreds of thousands of Ukrainians took to the streets when the Yanukovych government rejected an association agreement with the European Union — a deal that would have brought Ukraine one step closer to the West and ultimately joining the European bloc. The demonstrations quickly turned into a massive anticorruption, pro-Western movement that toppled the government by early 2014. Yanukovych fled the country, and Ukraine’s new leaders, presenting themselves as pro-Western, anti-corruption reformers, promised to transform the country. Three years later, many Ukrainians are disappointed. Ukraine’s postrevolution president, Petro Poroshenko, is an oligarch who owns a media empire and a large candy business. Amid this all stands Sytnyk’s NABU, set up in 2015 in part thanks to pressure from the United States, European Union and International Monetary Fund to have an independent group of investigators tackle Ukraine’s vast corruption networks. And NABU, so far, really has been clean, says Daria Kaleniuk, executive director of the Kiev-based Anticorruption Action Centre. She tells OZY “appointments were not because someone paid a bribe or parents negotiated a place — there was real competition” for the jobs. Sytnyk himself was chosen after being grilled by domestic and foreign experts, including the head of the European Anti-Fraud Office. So far, Sytnyk is doing his job “very honestly,” says Artem Myrhorodskyi, head of the Secretariat of the Reanimation Package of Reforms, a coalition of 73 Ukrainian nongovernmental organizations. Sytnyk has investigated 319 corruption cases, unearthing damage to the Ukrainian state estimated at over three billion dollars. Sytnyk’s work has led, among other things, to the suspension of the chairman of the Central Election Commission of Ukraine and the arrest of individuals such as the former head of the State Food and Grain Corporation. “Going after ‘big fish’ sends a signal to society,” says Kaleniuk, referring to high-profile government allies who previously saw themselves as above the law. Sytnyk doesn’t like the term big fish, but he’s certainly caught some. In early March, Roman Nasirov, the head of the State Fiscal Service of Ukraine (the equivalent of the American IRS) was arrested. NABU’s investigations have even indirectly impacted American politics: In August, Sytnyk confirmed that the name of Paul Manafort, a former Trump campaign manager, appeared on a secret ledger kept by associates of former President Yanukovych. Of course, change takes a long time, and Transparency International still puts Ukraine as number 131 out of 176 countries in its corruption ranking. NABU has 57 cases in court, but with the exception of five plea agreements, no one has been convicted. Sytnyk and others want to create a special anticorruption court — a real possibility, says Kaleniuk. Sytnyk’s activities are not universally popular. “Sytnyk is under the influence of some members of parliament,” asserts Volodymyr Ariev, a member of Ukraine’s parliament, the Verkhovna Rada, representing Petro Poroshenko Bloc. He believes Sytnyk is under the influence of a group of members of parliament who earlier served as civil society activists and went into politics after the revolution. Ariev added that Sytnyk’s team — who are indeed mostly twenty- and thirty somethings — lack experience. Tensions between NABU and unreformed government institutions often play out behind the scenes, as when government offices refuse to fully cooperate with NABU, but at times they take a dramatic, public turn. 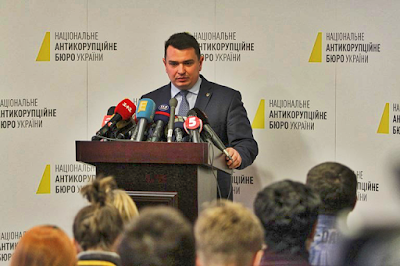 In August, the General Prosecutor’s Office — a largely unreformed government body — conducted a raid on the NABU office, using a warrant from an allegedly corrupt court and claiming that NABU is suspected of illegal wiretapping. Their search did not turn up any incriminating evidence. When asked if he foresees relations with the prosecutor’s office improving, he laughs wryly. But no shortage of the Ukrainian public stands behind him.